Guests are met in Amsterdam** and transferred by private chauffeured minibus to Panache. 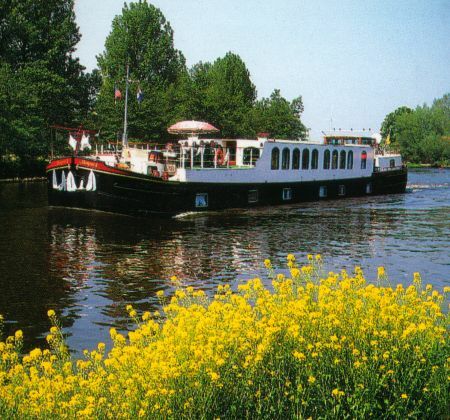 Once on board, enjoy a champagne welcome and an introduction to your crew and hotel barge. Dinner on board. Perhaps visit the Alkmaar cheese museum and enjoy a cheese tasting, before our first cruise to Zaanse Schans near Amsterdam, a place renowned for its wooden windmills, barns and houses built in the traditional Dutch style. After lunch on board, we take a tour of Zaanse Schans, an open air conservation area and museum, giving you a vivid impression of the Dutch way of life in the 17th and 18th centuries. This historical area consists of authentic houses and windmills, an historic shipyard, pewter factory, a cheese and dairy farm and an age-old grocery store dating back to the 1900's. Dinner on board. We enjoy an early morning cruise to the historic city of Haarlem, dating back to the 13th century. After lunch on board, this afternoon marks a highlight of the week with a visit to the world famous Keukenhof Gardens, known as the 'Garden of Europe'. There are more than 100 acres filled with over 7 million flowering bulbs and we stroll through a breath-taking backdrop of colour on this unforgettable half-day excursion. Dinner ashore this evening at a local restaurant. An optional very early morning tour to Aalsmeer flower auction, where some 17 million cut flowers from all over the world are traded each day. We return to the hotel barge for breakfast, then enjoy a tour of Haarlem. The city is home to the Frans Hals Museum founded in 1862 with its vast collection of Old Masters. Other highlights include St. Bavo's Cathedral on the main square, where both Handel and Mozart played the magnificent Muller organ, or there is free time to visit a fine selection of boutique shops. After lunch on board, we cruise to our mooring at Oude Wetering where there is time to walk or cycle along the towpaths around the lake. Dinner on board. After breakfast we cruise to Leiden. Home to one of the oldest universities in the country and the birthplace of Rembrandt, Leiden is an historical city full of charm and character, a perfect place to explore on a bicycle, or simply stroll the banks of the pretty tree-lined canals. This afternoon we take a tour of the city and a private boat trip, with your tour leader explaining the history that dates back to Roman times and more recent sites such as the church, St. Pieterskerk, from which the pilgrims departed for America. Free time to explore the many local cafes, boutique shops, markets and antique dealers. Dinner on board. Morning cruise arriving in Delft by lunchtime, our final mooring. Delft is renowned for its pottery ceramic products, which were styled on the imported Chinese porcelain of the 17th century. This beautiful, unspoilt town is more than 750 years old, and began as the home port of the Dutch East India Company. Following lunch, we visit the Royal Delft factory, just 5 minutes' walk from our mooring to learn how this world-famous porcelain is made. You will have time during the afternoon to explore Delft further. Captain's Farewell Dinner on board. After breakfast, guests are transferred by private chauffeured minibus to their choice of location in Amsterdam**. On alternate weeks the cruise is in the reverse direction. This is a sample itinerary and is subject to change. Note: This is a sample itinerary and is subject to change.